Board games can be a useful and ready asset for the ESL classroom. Most require little to no preparation, and with a little patience, your English learners add a new resource to their language studies. On top of all that, board games are a fun way to learn new vocabulary and make a change from the normal routine. 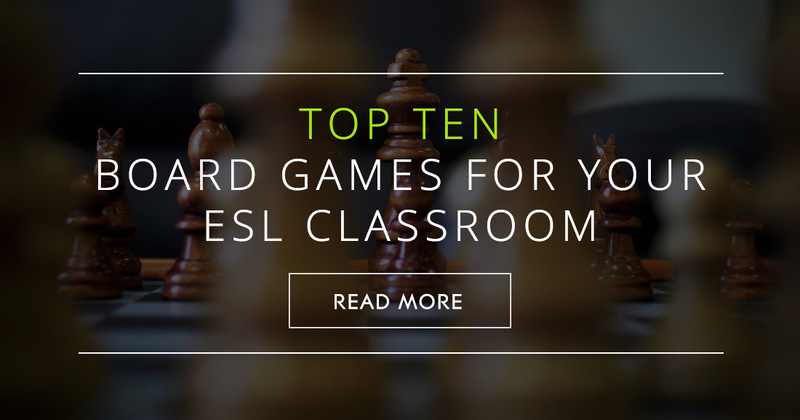 Here are some tried but true board games that many ESL classes have enjoyed. Hundreds of ESL students have played this classic word game. In the game, students receive a selection of letters which they must use to make word in a crossword style grid. When you, the teacher, also play, you have the opportunity to introduce unusual vocabulary to your students. Straying slightly from the rules makes for a more enjoyable game for nonnative speakers. Try allowing use of the dictionary at any point for any player and refrain from keeping score. Upwords is a game very similar to Scrabble. In this game, students use their collection of letters to build words on the crossword style grid. Unlike Scrabble, in Upwords players can place letters on top of existing letters to change a word that is already on the board. For example, on a player’s turn he may add a T to the word bash turning it into bath. In this game, your students will see the relationships between words and recognize patterns in English spelling. A relative newcomer on the game scene, Banagrams uses letter tiles to create a grid of words, but in this game no structure is permanent. Players start with a set number of letters and use them to create their own word grid. When one player has used all of his letters, everyone must draw another tile and incorporate it into their own structures. Each person can rearrange his word grid as desired. This game can be fast paced when higher-level students play, but even with less advanced students it is a ready source for learning new vocabulary. In addition, it teaches students flexibility with words and spelling structures. Similar to Upwords, Scrabble Slam uses cards printed with letters to modify an existing word. In this game, there is only one four-letter word on the board and all players must use their own cards on this word. By the traditional rules, everyone plays at once, and the player to use all of his cards first wins. However, ESL classes may want to take turns playing on the word so your class has time to think and absorb each of the words that are created. Scattergories is a way for your students to practice using the vocabulary they already know. In this game, students receive a list of ten categories. With a roll of the 26-sided die, a letter is designated for the round. Players must then think of a word which begins with that designated letter to fit each of the categories. Answers may be something like the following: boy’s name/Tom, food/tomato, city/Toronto, game/tic-tac-toe. A timer is set, and when time is up the group reviews the items they listed. Any words that more than one player listed are eliminated. Each remaining word is worth one point. This game can be a challenge for students still learning the language, but it can easily be adapted for lower level students. Feel free to define your own categories, linked, perhaps, to a unit you are studying in class and then continue as usual. Catch Phrase is a word guessing game in hot potato style. The starting player has a disk which gives him a word. He can say anything to get the rest of the players to guess the word on the screen. Once that word is guessed, he passes the disk on to the next player. That person then does the same. After a random amount of time, the disk will signal that time is up, and the person holding the disk at that time receives a point. The goal of this game is to have as few points as possible. To make the game easier for your ESL students, you can challenge each person to have his word guessed before the timer buzzes. Then reset the disk and send it on to the next player. Taboo takes the concept of Catch Phrase and brings an even greater challenge. In this game, players must get their team to guess a given word, but each word comes with related vocabulary that cannot be used in the description. They key in this game is to think of another way to give the clues on the card. Players do this by using similar but not the same vocabulary. You can modify this concept and have your students write out clues for a given word, avoiding the vocabulary on the card. Limit the description to four or five sentences. If the class can guess the word from the clues that are provided, the writer scores a point. You can feel free to use vocabulary that the class has studied or select specific words from those that the game supplies. This game challenges your students to be creative with their language use – a skill that is useful for all language learners. The game of balderdash is best reserved for advanced students. In this game, on his turn, a player is given an obscure vocabulary word. Each player must create a false definition of the word in hopes that the other players will believe it is the true definition. When playing this game, the teacher should be moderator every turn and correct any grammatical problems in the fictional definitions as well as write the correct definition on an identical slip of paper. Then s/he should read all of the definitions to the players who must vote for the one they think is correct. Any player that guesses correctly scores a point as does any player who receives a vote from another player. Though not a traditional board game, Jenga can be a handy resource for students to get to know each other. Using any list of icebreaker questions (you can try these: 50 Most Amazing Conversation Starters) , write one question on each block. Then when your class plays the game, each person must answer the icebreaker before placing the block on top of the pile. By doing this, your students get speaking practice while getting to know one another better. Besides, it is always fun to see who makes the tower fall! Create your own board game with pictures from an I-Spy book or any other pictures that contain a plethora of objects. On a piece of paper, have your students write the letters of the alphabet from a to z. Then let them look at the picture for a set amount of time (three to five minutes is good) and try to identify an object that begins with each letter. Of course, it will be nearly impossible to find an item for every letter, but by using creative vocabulary and having keen eyesight, your students will be able to fill in more letters than they might think. This is another game that is good for vocabulary development and is less threatening for beginning level students. Sometimes the best ESL classes do not come from within the pages of a book but from a piece of cardboard painted with bright colors. Try one of these games in your classroom or find others that work for you and your students, and bring a little laughter to today’s learning!